Being a creative person is the best thing in times of trauma, sadness and general unhappiness. Being creative provides you with an outlet that may not otherwise exist; a space to release all the inner burdens. I had a series of panic attacks last year as a result of some emotional baggage and initially they were out of control and horrific. They are very physical events that consume your entire body. I’d never experienced anything like them before so it was something entirely new and very unpleasant. However, as usual art came to my rescue and I found refuge in it as an expressive tool. Having experienced the physicality of the panic attacks, it seemed natural to translate this kinetic experience into the art-making process. Consequently I created a series of works, what I call my ‘Panic Attack Series’. Given the process it took in creating them, they could be considered Action Paintings. Action Painting first came into being in the late 1940s and early 50s with pioneering artists such as Jackson Pollock and Willem de Kooning leading the way. Action Painting is a loose and fluid mode of art making in which the paint is dripped or smeared onto the canvas. In this instance I was smearing it on, using my forearm as a brush which given the friction between the paint and paper was painful at times. Yet this pain became part of the piece. Working large scale was necessary as I required the breathing space to expel my negative energy. The works are far from perfect, but I think my vitality comes across especially given the unconscious circular motions I ended up working in. I was surprised to find I visualised my panic attacks as circles and this meant that they went from being a nightmarish experience to a visual object which I think aided my healing process. I was not surprised by the fact black felt like the only suitable colour; darkness and the heaviness of my emotions was encapsulated perfectly in this palette. I also did some smaller charcoal renditions which looked almost like circular sound waves (top right of the above photo). 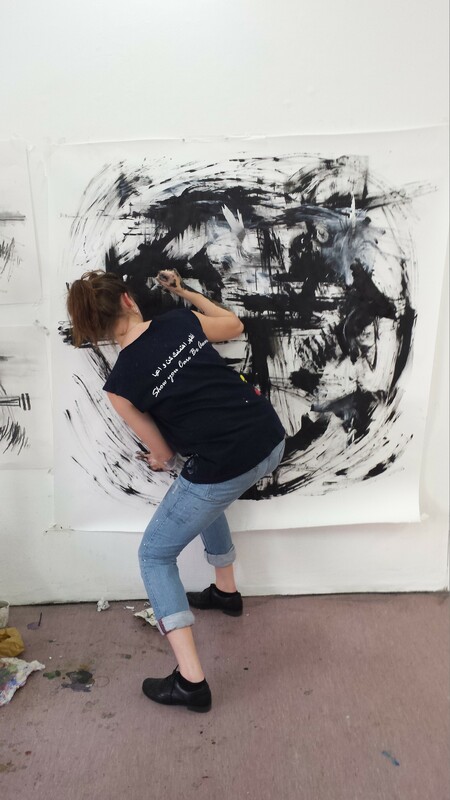 I think the need to get messy was an instinctive impulse I had in these expressive works. Sitting tidily working in a sketchbook would not have had the same impact. I needed to immerse myself physically as well as mentally in the work to be truly unburdened. And it definitely worked. The creation of these pieces was incredibly liberating and I literally felt like a weight had been lifted. My shoulders felt lighter and my head felt clearer. It was as if by creating these works I had expelled this mass of black energy from my system and I was free to start again.